This page shows all archived items that have been on the front page of the site previously. HOLIDAZE Winter Event is now open! 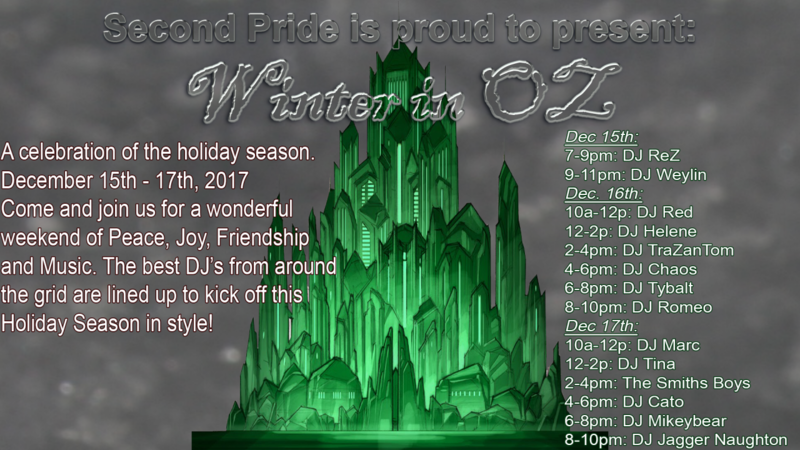 The snow is falling, the bells are jingling, and the Second Pride sim is decked out for Holidaze, our Winter event! Come take a stroll (or skate…they’re free!) along the icy walkways and check out our vendor’s shops. Maybe bring some friends and take a photo or two, and look (or climb) up to the hillside to see the magical Arctic Express taking flight! More special things to come…stay tuned! At a special meeting of the Board yesterday (12/1/18), following a regular business meeting, the Board voted to appoint Lee McKay as the new Chairman. A statement from the new Chairman will be posted here soon. Today after a productive board meeting, our chairperson, Rez Vale-Starfall resigned from Second Pride. This was after he left the meeting and was done by announcement on our public group. I can assure you this has left the board members in shock as none of us saw it coming. We will continue to work hard on building Second Pride and having quality events. 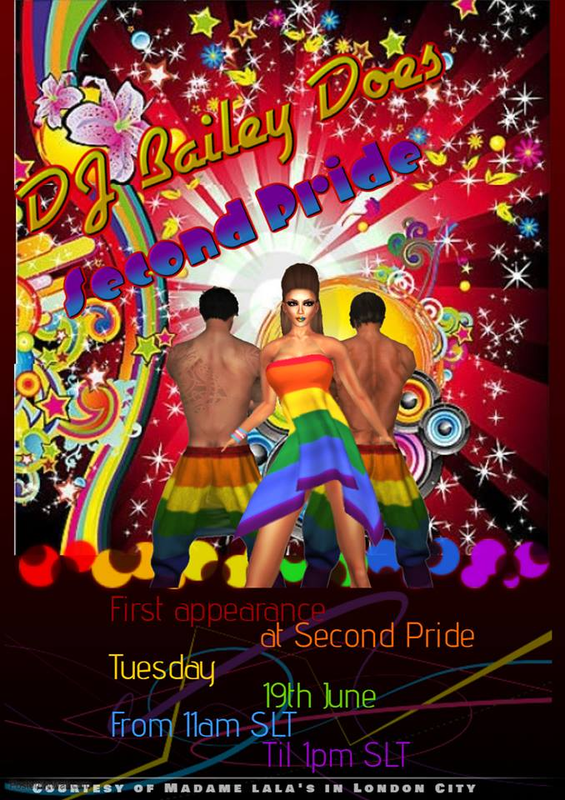 We thank Rez for his hard work and dedication to the LGBTQ Community of Second Life. In the interim, please watch our group and website for announcements on our upcoming December holiday event. Party like a MonSTAR with Second Pride! Join us on October 28th, all day…more details to come! You may or may not have heard about a very upsetting Board meeting today (October 6th, 2018). As everyone is aware there was a snafu with the original voting process. This, as I have stated already publicly, was my fault. I owned my mistake and the Board took measures to correct that error. Which I supported 100%. It was Bock McMillan that pointed out to me that the IT Director was to be the the Election Chairman, according to the Bylaws in place. He was again 100% correct. The system that was originally used was not vetted by the Election Chair, Lee McKay. Therefore, it could not be used in the state it was in. Additionally, the security was just not there. That was a serious concern to all the Board and should have been with the candidates and members-at-large. A new voting system was created specifically for Second Pride Elections. It took longer to create then initially anticipated. Anyone who has looked at an SL script knows how complex they can be. We all wanted a secure way for everyone to vote. That way there could be no questions as to the legitimacy of the vote. That’s the background. So what happened? Today during the Second Pride new Board Member seating the newly elected Marketing Director called into question the integrity of the Election Chair and myself. Also called into question was the legitimacy of the voting process. Mind you he WON, by a large margin. After some back and forth with others on the Board, the Marketing Director began making derogatory statements and accusations against the Second Pride Board. Pointing out how unfair the election process had been and how it was suspicious how everything happened and how it was handled. Stating that he was not pointing fingers, but calling out the positions of the Board that he had issue with. Well, since there is only one person in any given Board position, it was easy to see how he was actually accusing that positions inherent occupier. He went on further to degrade the members-at-large, stating “I know that during the second process, the overall feeling was very subdued, people felt angry, disgusted and resigned.” As Chairman, I did not get that sense. During the process, Jimmy was constantly asking for updates on the number of votes being cast. He was told no that was inappropriate. It only incensed him. He stated that in real life you could see how the vote was going and how many people voted. So, I am going out on a limb here, but we in the USA don’t know how many votes were cast until after they are all counted. I am not sure about Jimmy’s country. Perhaps it is different? However, we ran the election process and will continue doing so, according to the rules in the USA. Jimmy went on to infer that the only reason the original election was deemed null and void, was to get Mr. McKay’s “friend” more votes. Let me assure you of one thing, I am not the smartest guy on the block, but I DO know Lee McKay is not the type of person to do something like that. Nor would he have anyone else do it for him. That is slander and a baseless allegation. Jimmy Augustus-Gracemount needs to apologize to Lee McKay for that. As Chairman of the Board, I lost my temper and yelled at Jimmy during the meeting. I apologize for letting my emotions get the better of myself at that moment. Lee and I both motioned to have Jimmy removed from the Board. It was seconded, and passed 5-2 in favor of removing him. Personally, I like Jimmy. He really is a fine fellow. I am not sure why, after winning the vote, he couldn’t just be happy with that and let it go. The outcome was the same. I am truly sorry that it had to come down to this. I was ready to resign, since it was *MY* fault the original vote was canceled. Bock was correct to point out the problem to me. Lee McKay was ready to resign. For the betterment of Second Pride as an organization, Jimmy had to go. The Marketing Directors position will be absorbed, as the Bylaws are written, by the Events and Community Relations Directors to split the duties as they see fit. It is with great hope that the future of Second Pride be as bright as it has been in the past. As we move forward into the future, let’s try not to forget why we are here. It’s not fame and glory. It’s not for recognition. 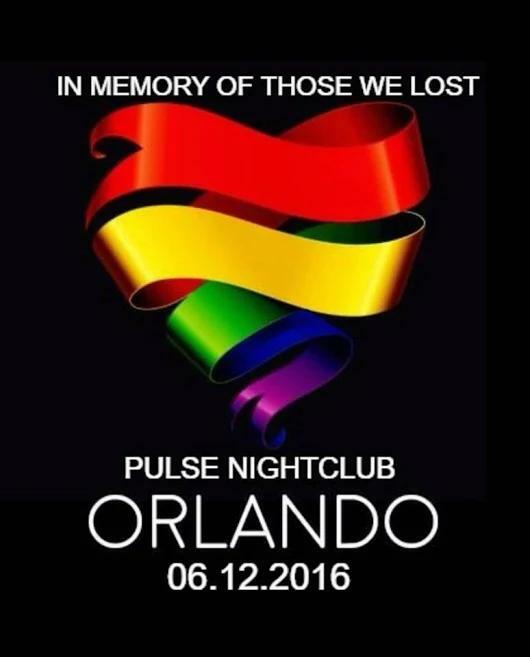 It is to do good work and to reach out to our fellow LGBTQ community and bring it together in a spirit that uplifts us all! That is why I ran for Chairman in the first place. It’s why I will continue to the very best of my ability. Correction: The first version of this post had the incorrect date of the meeting. This was a typo on the part of the Webmaster, not the Chairman. On September 27th, 2018, the Election Committee certified the following results for the Election completed on September 26th, 2018. The voting has ended for the Marketing and Building Director seats on the Board. The results have been certified by the Election Committee and passed on to the Chair for announcement. The Chairman is out of the country at the moment, and you’ll see this announcement in-world and here on the website as soon as he releases it. We are still looking to fill the Community Relations Director seat…more on that coming soon as well! The Election Committee has done significant testing of our new voting solution, and believes it to be secure and reliable. Therefore, voting in the Second Pride Board Election for the positions of Marketing Director and Building Director will run from September 20th, 2018 through September 26th, 2018, a full seven day period. On September 28th, 2018, the Election Committee will certify the results and the Chair will make the announcement. Installation of the new members will be done on October 6th, 2018. Your candidates for Marketing Director are Jimmy Augustus-Gracemount (jimmmmmy) and Kaiden Brandt (Kalculate). For the position of Building Director, the candidates are Sтαятєя Ɛνєηѕтαяя (starter232) and Dҽʋιɳ Kɳιɠԋƚ Dɾαƙσɳ (devindevin1111). Click on their names to view their candidate statements. The Community Relations Director seat is still open with no current candidate. Per the Bylaws, the Board has the ability to name an individual to this seat, so it’s not too late to step up! If you or someone you know is interested in being a major part of Second Pride, please contact one of the Board members TODAY! It’s the perfect time to get involved! 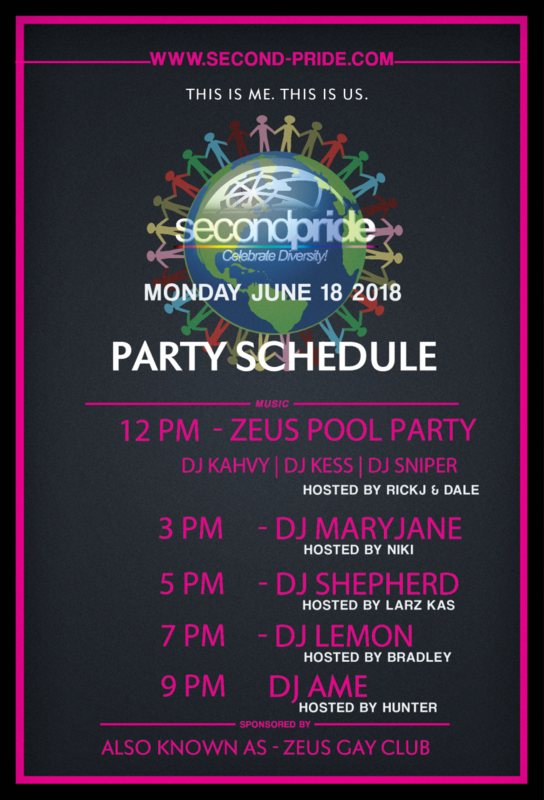 The new Second Pride Bylaws were adopted by unanimous vote of the seated Board of Directors in a meeting held September 5th, 2018 at 6:30 pm SLT. The new Bylaws are the same as the proposed version and are linked under Documents in the site menu. Minutes of the meeting will be posted soon. The new voting solution will be completed soon and voting is expected to start within the next day or so. 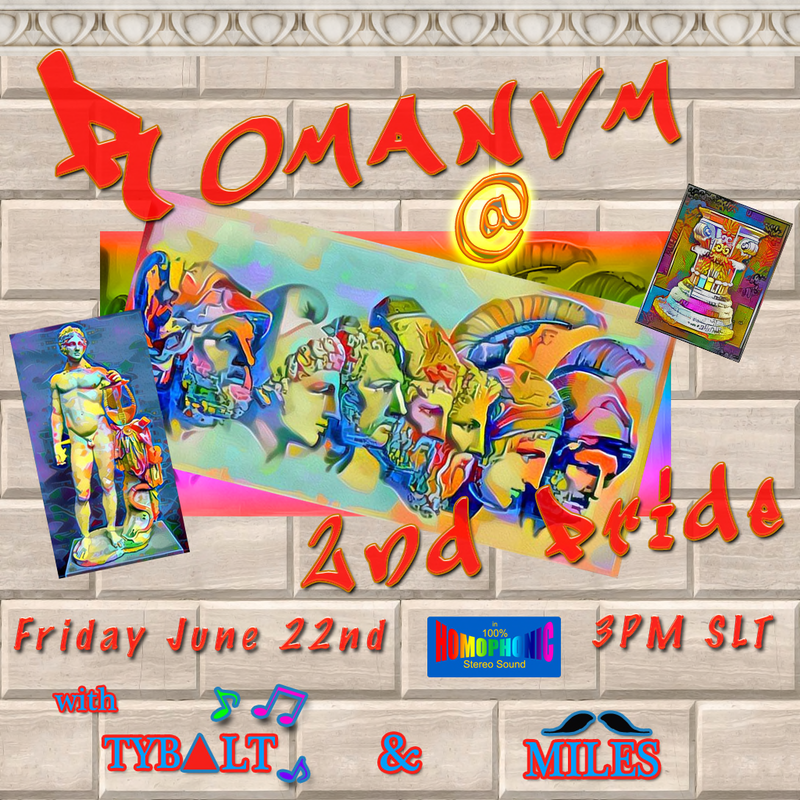 Watch here and in the Second Pride Festival group for updates and instructions. The candidate for Community Relations Director has decided not to accept the position. Therefore, we have an open seat and per the Bylaws, that seat is available now for anyone who wishes to be considered for it. This would be a Board appointment, unless we have TWO candidates before voting begins. If that happens, then that race/candidates will be added to the ballot, with a simultaneous discussion phase opened on the website. If you are interested in being Second Pride’s Community Relations Director, please take a look at the Bylaws for the duties involved and speak to any current Board member for next steps. Due to a technical and communications glitch, the voting for the Second Pride Board Election has been halted. Votes that have already been cast will NOT be counted. A new voting method is being worked on right now, and we expect to restart voting on September 7th or 8th. This will allow us to have more accountability in the voting results. If we start by the 8th, it is possible that we will still be able to install the new Board on the 15th as planned. At worst, if there are no voting discrepancies, we might need to push the installation meeting by a day or two. Group joining will remain closed until the election is completed. Notices will go out with voting instructions as soon as the new method has been tested and finalized. Expect voting notices to be frequent and repetitive since we will be working to encourage those who have voted already to return and cast their vote again. We apologize for this unfortunate development. At a Board/Member meeting on August 25th, 2018, a new set of Bylaws was proposed and placed on the website for comment and discussion. After ten days of discussion, the Board will meet again to vote on these new Bylaws. Please click on “Documents” above to join in the discussion! The comment section on each candidate’s page is now open for questions and discussion. To participate, you will need to have an account on the website if you don’t already have one. Then click on the candidates link under “2018 Election” above and the conversation will be beneath the candidates opening statement. Some candidates will be automatically seated since they are the only candidate for that seat, but please go ahead and pose questions and comments on those pages as well. Open and free discussion is always welcome! The Marketing Director and Building Director seats have more than one candidate and will be voted on starting September 1st, so this is your chance to decide who your candidate(s) of choice are! Please click on the link below to submit your candidate statement for the Second Pride Board of Directors. Open positions are Treasurer, Events Director, Marketing Director, Community Relations Director, Security Director, and Building Director. To see the current candidates’ statements, click on “2018 Election” above and see the list beside each open Board seat. Please note that there are amendments to the Second Pride Bylaws in the process of being proposed and ratified. These changes to the Bylaws could result in certain Board positions being combined. In the event that a Board seat is combined during the election process, all candidates for the combined position will be considered candidates for the combined position, or a candidate may withdraw if they do not want to serve in the combined seat. Meeting minutes are now available by clicking here, or by clicking on Documents in the menu above. Everyone is encouraged to read through these minutes and also to participate in the future of Second Pride as we go forward. If you want to know how you can participate, please contact any of the Board members in-world. Annual election dates will be announced. Seated Board members are not up for re-election this year, but all open seats are. 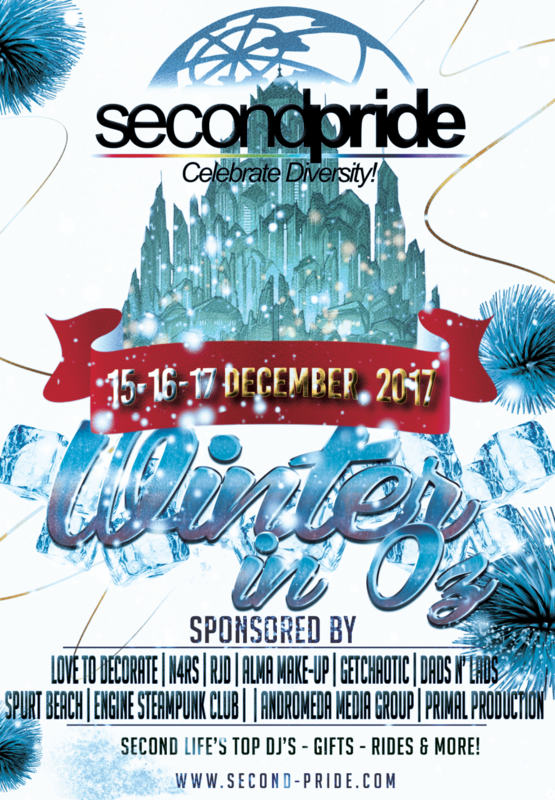 Open Forum – If you are a member of the Second Pride group, then this meeting is for you. It’s your time to ask questions and voice concerns. Second Pride 2018 has now ended, and what an event it was…watch this page for updates from the event and news of what’s coming next! For a look back at the event, click on “Pictures” in the menu above. 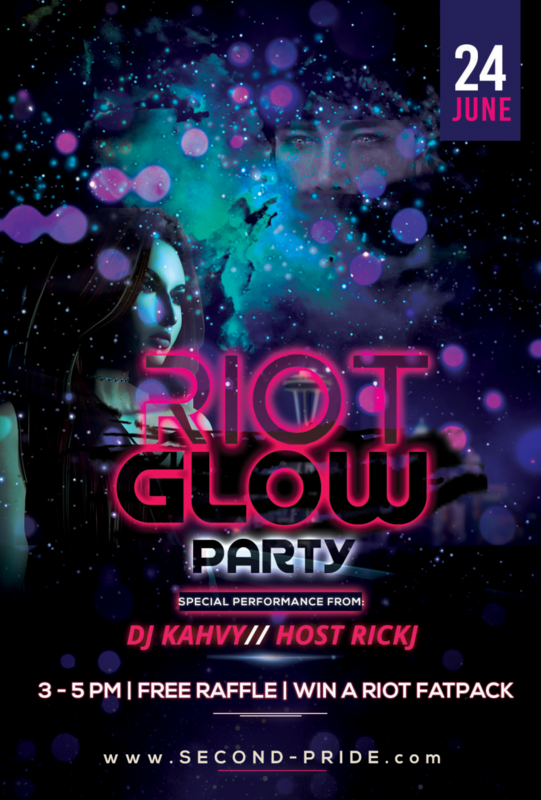 Scroll down for party posters! 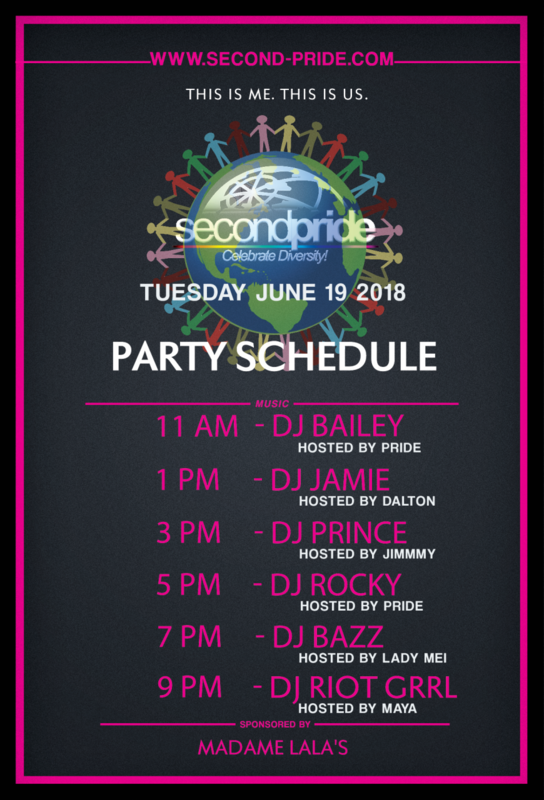 Second Pride 2018 kicks off June 15th – 24th! 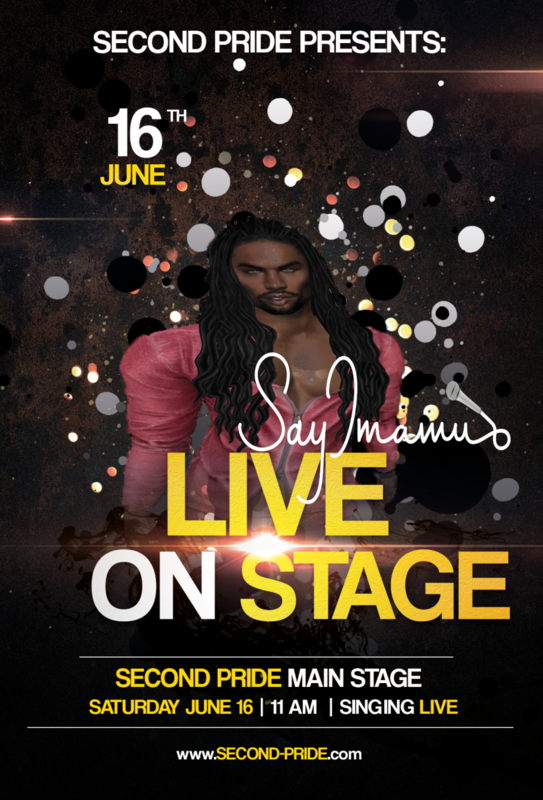 The festival will kick off at 7pm Friday June 15th, with 9 days of events, fund raising for this years chosen charity The Trevor Project and of course shopping with some of the grids hottest designers in fashion, home goods and landscaping. This year there is a photo exhibit, we have the Diva Tribute group, Men in Motion and RIPA Dance after Dark. We are looking forward to seeing all of you at this years celebration! REGISTER NOW FOR A HUGE DISCOUNT UP TO 10,000 L$ ! 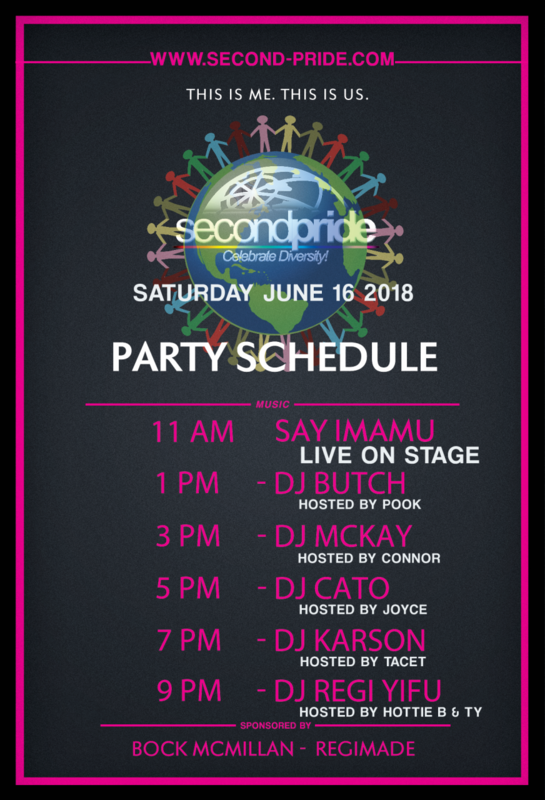 Our Second Pride Chairman, I would like to extend to you an offer of reserving your space for the 2018 Second Pride Festival to be held June 15th – 24th, 2018. Our theme this year: This is Me. This is Us. A Celebration of Community. The more people sign up, the more likely it will be that Second Pride is able to go over two sims this year! So it all depends on YOU! 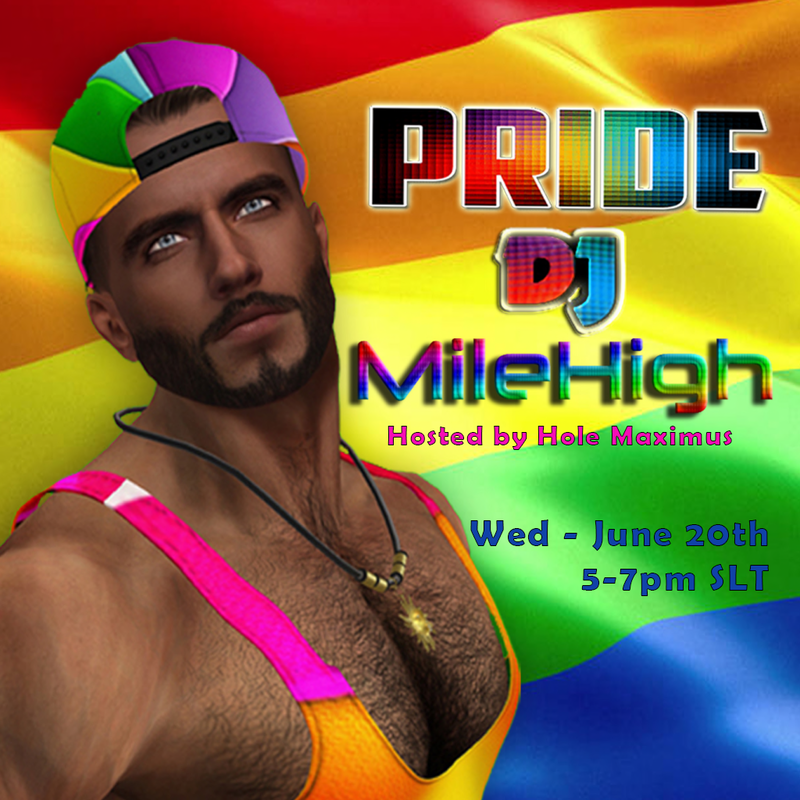 Second Pride is a charity event for equality and unity in Second Life. The LGBTQ+ Community is wide and divers in Second Life and they need your support! Below you will find the entire text of the Pride Call for Vendors and Sponsors and All the options but the main thing is: we NEED you!!!! So don’t wait!!!!! You can be a SPONSOR, you can be a VENDOR or you can be BOTH! Vendor Rent and Sponsor Funds are how Second Pride stays in Second Life year after year. ALL options are listed below. For easy Measure, The vendor Only options for EARLY SIGN UP are Promo ( No vendors) 2000 L$ – Copper 3000 L$ – Silver 10,000 L$ – Gold 17,500 L$ – Platinum 25,000 L$ – SPONSOR only: Ruby 10,000 L$ – Diamond 20,000 L$ – Patron 30,000 L$. You can also go for a COMBINATION!!! We can’t wait to see you all sign up! Have a Fantastic Day! We will be offering the following types of packages for the 2018 Festival. Pre-register before April 1st, 2018 for a lower package price. After April 1st, prices go up! NO EXCEPTIONS!! Fill out the form here to confirm your spot! *Minimum is guaranteed. Depending on number of sign ups this number may or may not increase. Are you ready to be Proud? Second Pride 2018 is coming! 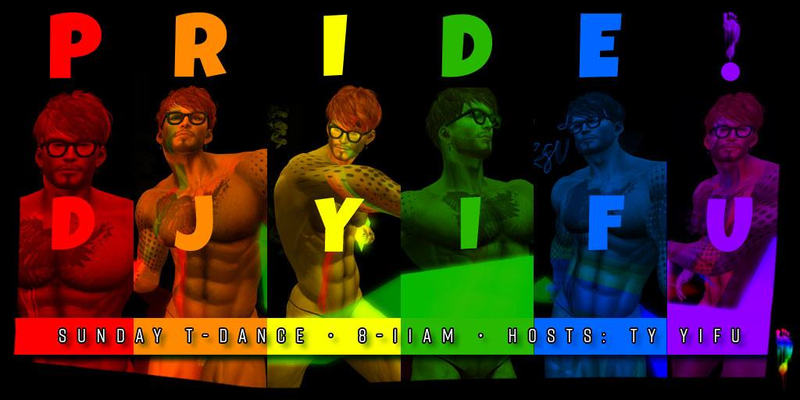 The official Pride festival of Second Life® will run June 15 – June 24. On this website, you can find everything about past and future festivals. Find our Vendors and Sponsors, Read our blogs, Get social and get involved here! 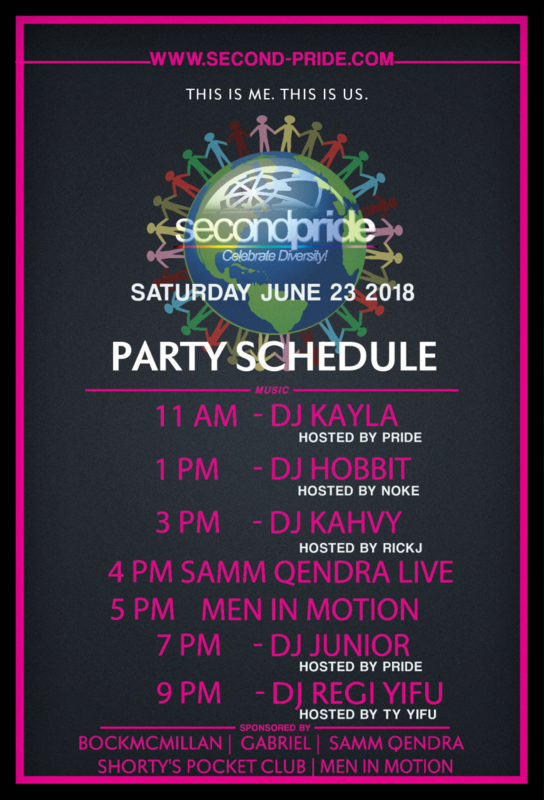 Second Pride® is the official Pride Festival in the Virtual World of Second Life®. 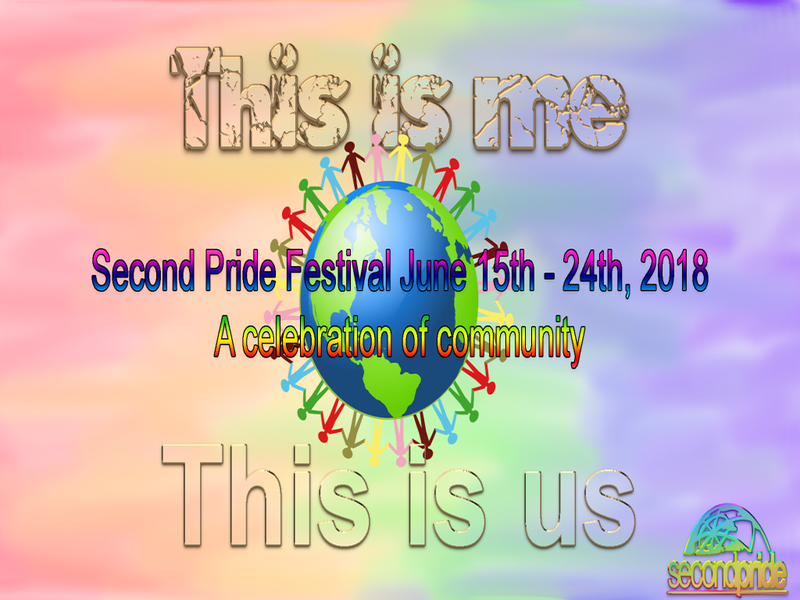 The yearly Pride Festival as well as fundraising Events are our main activity, but we also actively support and help various organizations, inworld and out, that work on LGBT rights and Support. 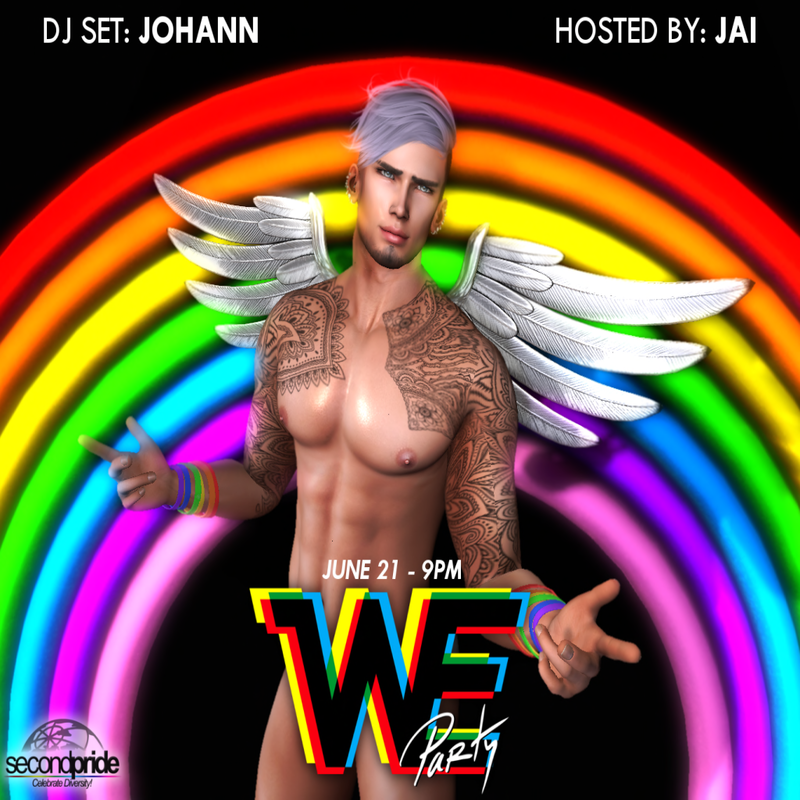 The Second Pride Festival, however, is about an international gathering of LGBT people in the virtual world of Second Life® created by Linden Lab™. 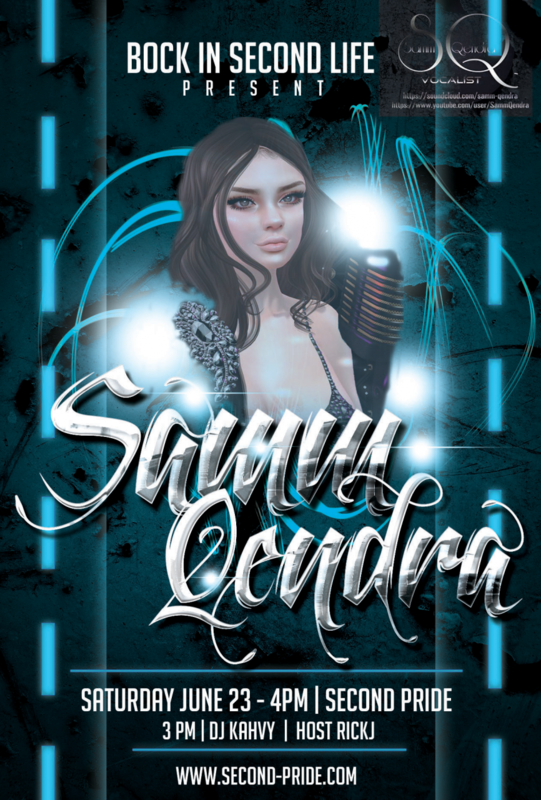 Celebrating Diversity within the Second Life community and promoting inclusiveness and acceptance are our main goals as a non-profit Organization. We are Proud to be Your Pride! I want to express my profound gratitude to all of our members that made the Second Pride Voodoo Halloween Festival such a huge success! 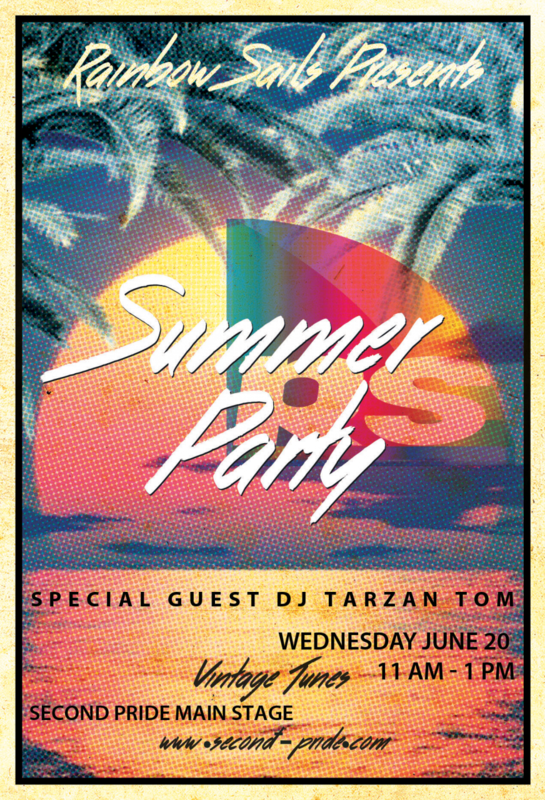 A huge Thank You to: DJ Ari, DJ Apollo, DJ Junior, DJ Nicco and DJ TarZanTom. Without your talents this event would not have happened. A Very special Thank You to “Madam Mr.” Secretary Mikey for hosting not 1, but 4 DJ’s yesterday. Thank you to our acting Security Director, Tootsie and her amazing team Levi and KIT. You 3 rock! Last, but certainly not least, Jak Calcutt! You transformed the SP region into a wonderfully spooky place that I think everyone enjoyed. In total we raised 24,290L$!! Once again, Thank You all! 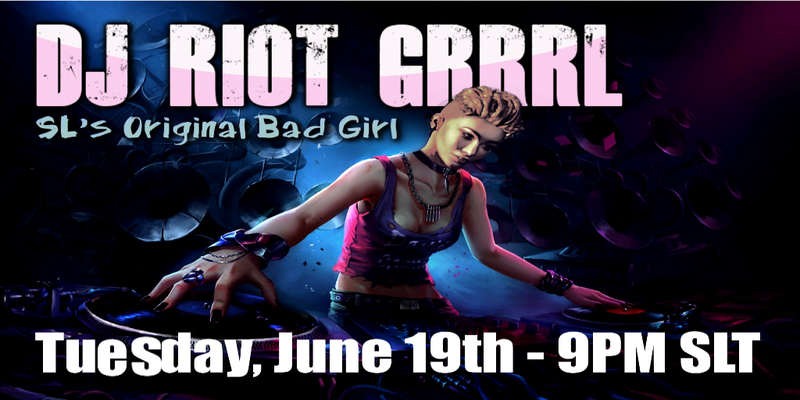 The DJ’s are lined up! The sim is looking spooktacular! It’s time to get some tricks and treats. 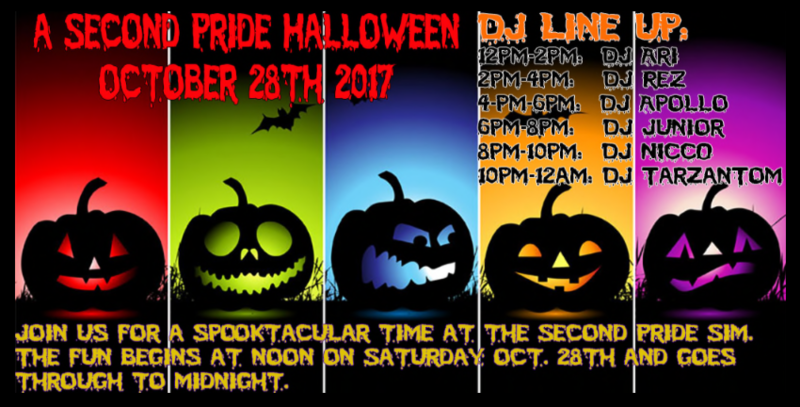 Join us for the annual Halloween Party sponsored by Second Pride. The festivites begin at noon SLT and run through midnight. 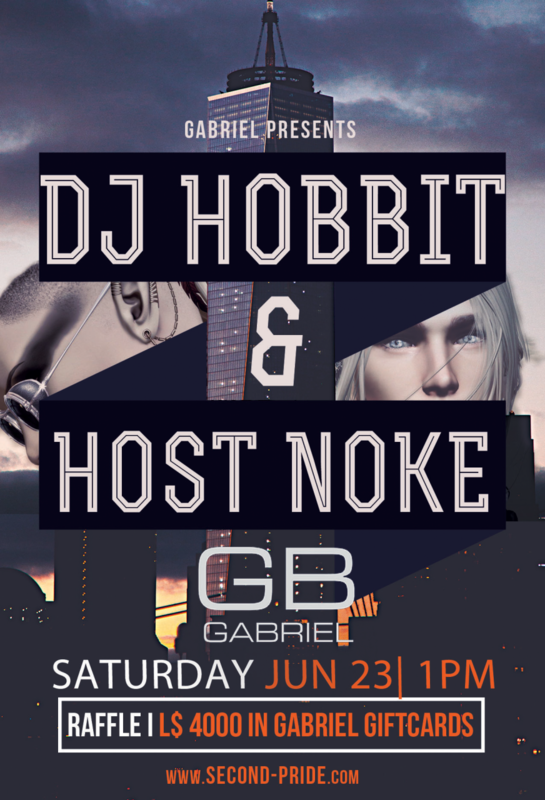 Some of the hottest DJ’s on the grid will be there spinning the tunes and keeping you moving. Check out the fun house! the rides and the big top! Check out the events calendar for the lineup! Allow me to introduce myself. 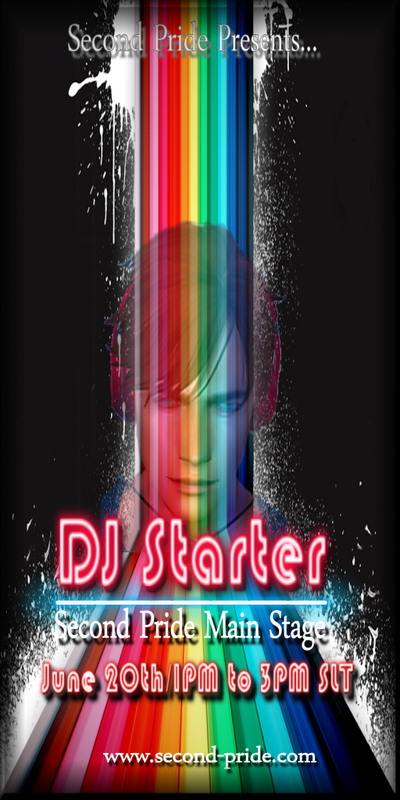 I am Rez StarFall (DJRez Cyberstar) and I am the new and current Chairman of the Board for Second Pride. I am a DJ and a clothing designer. 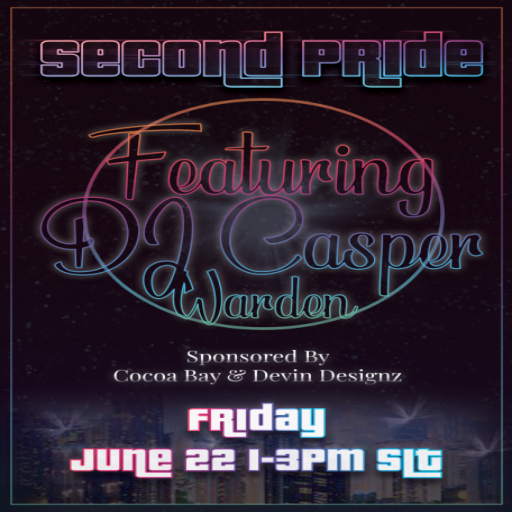 I have been a supporter of Second Pride for as long as I can remember…some years as just a DJ and at others a sponsor and/or vendor. I ran for the Chairman position with one goal in mind. To make Second Pride the best it can be. I want to make sure that our members feel comfortable with each other and themselves. All of us on the Board have that desire. That is my expectation. The reality is in your hands. Our members make us better than we can be alone. We are currently looking to fill the open positions on the board on an interim basis, so if you or anyone you know would be interested, please let one of the board members know. A huge THANK YOU to the former board members that have stepped up to help the current board through the transition as acting board members. Your help in spreading the word is most appreciated! 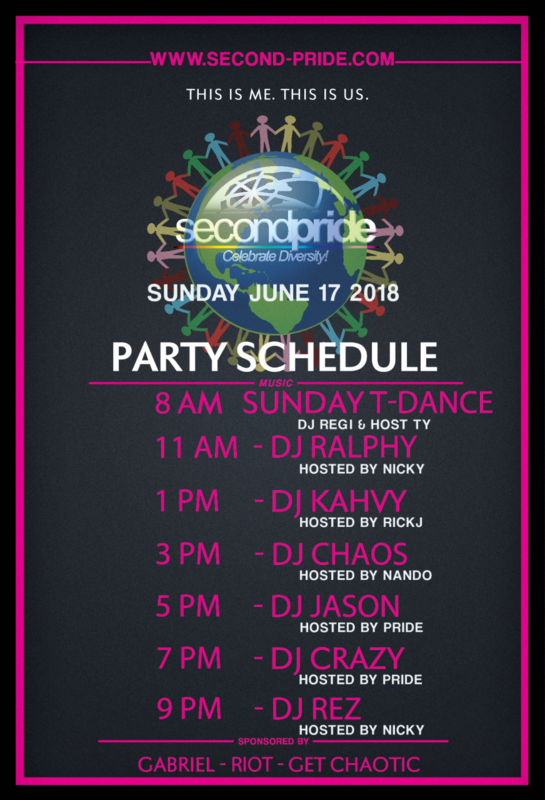 Be part of making Second Pride 2018 Happen! Run for the Board! The elections for the Board of Directors are here! We are now accepting candidates for every position for the 2017/2019 terms. 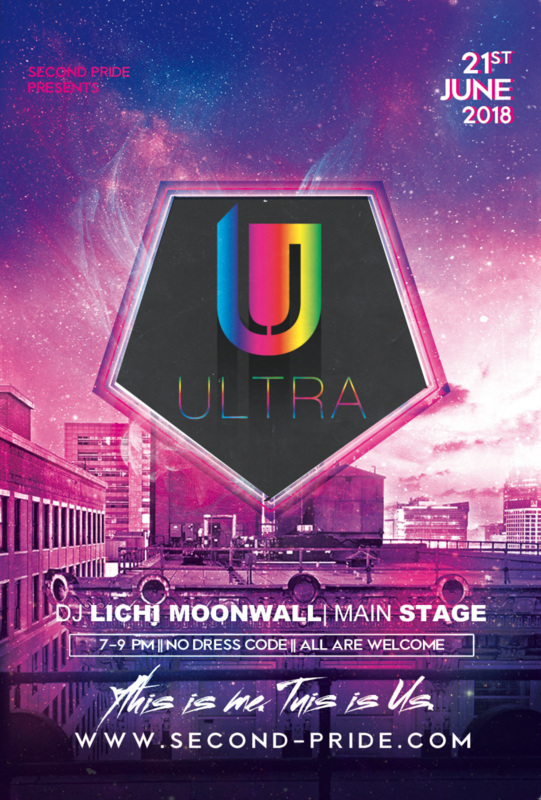 This is a great opportunity to make a difference and be a part of the largest and most diverse LGBTQ event on the grid. 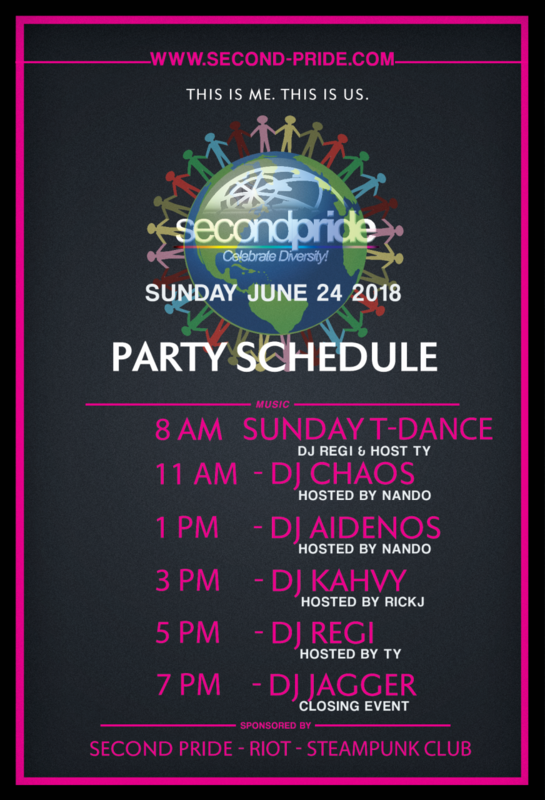 Over the Past 11 years, Second Pride has been there – bringing LGBTQ people together from all over the world and all over the grid – lesbians, gays, transgender, bisexuals and allies. In 10 days of celebrating, we meet people we wouldn’t otherwise. We remember where we have come from and also the struggles we have in common. In doing so, Second Pride has generated millions of lindens in donations to diverse LGBTQ groups around the world. 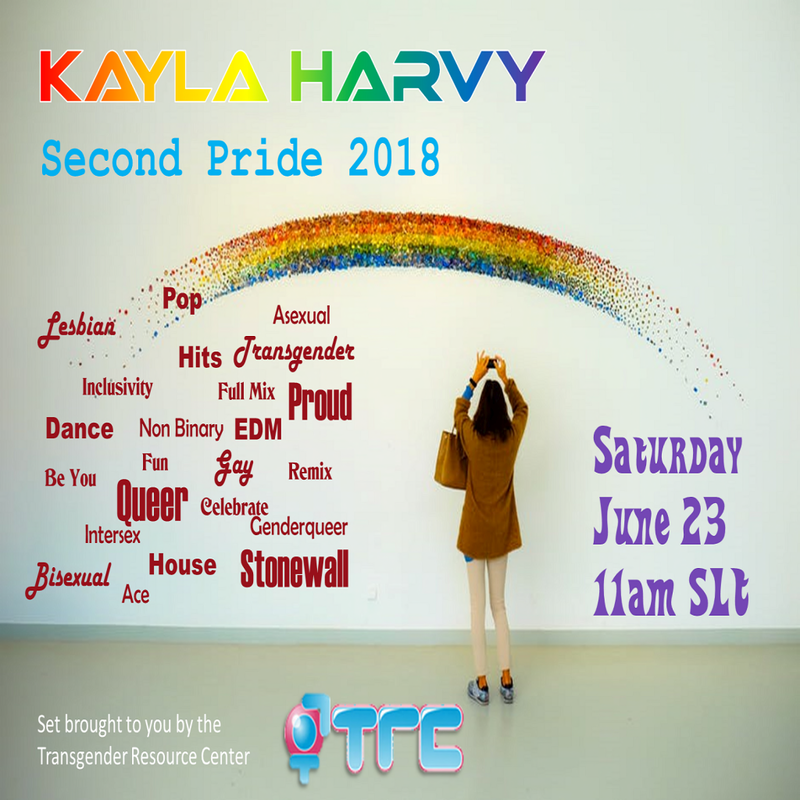 Have you enjoyed Second Pride? Have you thought it needed to be made better? Do you want to make a difference? We need your energy, ideas and hard work. Declare your candidacy for an open position and become a part of moving Second Pride forward. Candidate statements are being taken online August 7th through Midnight August 19th. Submit a brief statement declaring your interest in the position, the skills you will bring to the job and why you want to be elected. All Candidate submissions should be submitted using this form for posting on the website. If you have any questions about the procedures or positions contact Lledge Eames or Viktor Sandman in world. Comment sections will be open for candidate question and answer from August 20th through August 26th. Elections take place from August 27th through midnight September 2nd. To vote in the elections, you must be a current member of the Second Pride group. Membership to the group is closed at this time until after the voting is complete. Voting will be done on the Second Pride sim, and will require your SP group tag to do so. Results will be announced no later than September 6th, following certification by the election committee. The new board will be installed on September 9th. Treasurer – Develop Budget; Financial reports to membership; Audit books; oversee expenses. The Treasurer should be familiar with downloading spreadsheets from the account summary information maintained by Linden Labs; the Treasurer should be familiar with multiple spreadsheet formulas and accounting. Thank you for an amazing 2017 Second Pride Festival! As the sun sets on yet another wildly successful and my last Second Pride Festival season. I’d like to take a moment to say some thank yous. I am so grateful for this years outpouring of participation not to mention I had the pleasure of working with some of the most amazing talents from across the grid. Our 2016 – 2017 Second Pride Board. Jak Calcut with his outstanding builds and designs, creating a feast for our eyes, Marge B for her behind the scenes accounting, Tootsie Nootan and her security team (Levi & Kit) keeping us all safe, and Viktor Sandman for all his patience scheduling and wrangling our performers. To our Volunteers. Kahvy & Garrett Smith for undertaking and creating some fantastic social media buzz along with all those bloggers. Lee McKay and his webmaster skills that put us back online. 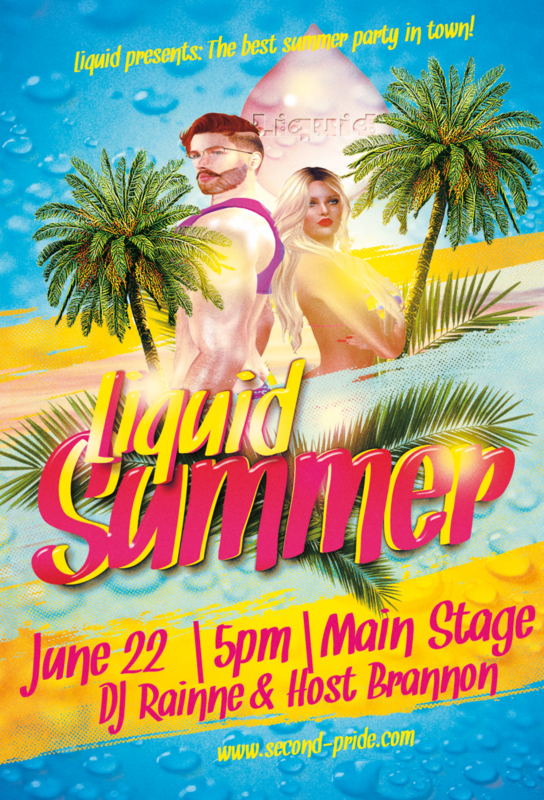 Our 2017 Sponsors: Bock McMillian, DNL Menswear, City of Central Kasra, TRC, Evan Greymyst, Rust Redfield & Alex Thaub, UnKindness, The Land of Rainbows, Chaos & Rod Jackson, City Of Varn, Ultra Event, 3Bears, GayList, Rock-Hard Club, [Heathens], Zac, Gay Fun Wolrd, and Gay Men’s Cove. Special thanks to GaliGear for providing our 2017 Festival T-shifts and my husband Oberon Eames for putting up with the craziness that comes with being Chairman of Second Pride. And last but not least EVERYONE that attended. Without you, our community, we could not have such a successful 2017 Festival Season. 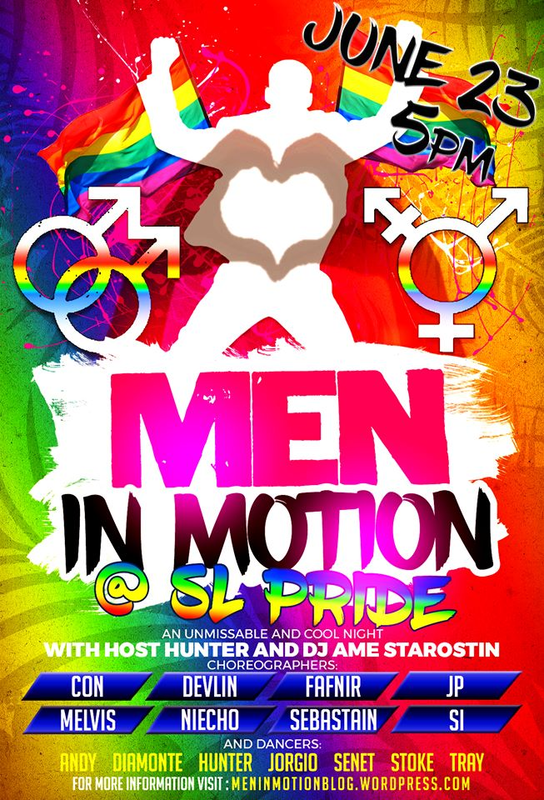 It is after all about community and creating this space where we can share and celebrate our Pride. On more than one occasion I was greeted by complete strangers and then thanked for providing them with such a true and wonderful pride experience. It was comments like that and many more that told me we had hit our mark. I can’t begin to thank this team enough. You ALL really outdid yourself and should be proud of all you accomplished. As I mentioned earlier this is my last year as Chairman. It has been such an honor to be involved in this organization. As much as I am ready to step down, I will miss it and all the nuances. Thank you from the bottom of my heart for allowing me to bring my hope and joy to you all through this wonderful outlet.